On 14 and 15 of May, The Belt and Road Forum (BRF) for International Cooperation was successfully held in Beijing. This international gathering brought together 29 heads of state and government, and 1,500 representatives from over 130 countries and 70 international organisations. The participation of Sri Lankan Prime Minister Ranil Wickremesinghe and his delegation fully showcased Sri Lankan Government’s commitment for the ‘Belt and Road’ initiative and the summit, itself. In the lovely season of early summer when every living thing was full of energy, distinguished guests and great minds gathered together, jointly pursuing BRI, a project of the century and made fruitful outcomes. Before and during the BRF, national governments, local authorities and enterprises reached a number of cooperation agreements, policy measures and practical results including 76 items comprised of more than 270 concrete agreements in five key areas, namely policy, infrastructure, trade, financial and people-to-people connectivity. The world economy is undergoing profound changes, presenting both opportunities and challenges. The UN 2030 Agenda for Sustainable Development with the set of Sustainable Development Goals at its core provides a new blueprint of international cooperation. Although various development strategies and connectivity cooperation initiatives from different countries have been put forward, still, the world economy is experiencing modest recovery with downside risks remaining. The growth of global trade and investment remains tempered, and the rules-based multilateral trading regime is yet to be strengthened. Huge funding gaps still trap the infrastructure construction worldwide. All countries, especially developing ones, still face common challenges of eradicating poverty, promoting inclusive and sustained economic growth, and achieving sustainable development. How to explore new development paths and gain new growth momentum? The world is anticipating a clearer action plan to answer the questions. “China should not be a bystander or a follower, but an active participant and a leader, making China’s voice heard and inject more Chinese elements into the international rules,” said President Xi Jinping. As China’s economy and comprehensive national strength grow steadily, China’s capacity and willingness to participate in the governance of global economy have been increasingly improved. The international community has been arguing for a long time whether globalisation is the treasure cave found by Ali Baba or the Pandora’s Box that gives out chaos. President Xi Jinping has given China’s answer to this question in the keynote speech at the 2017 World Economic Forum in Davos, and the BRF Forum in Beijing. Now China’s voice has become the strongest support for economic globalisation. China raises up BRI and supports the globalisation and developing countries’ growth in order to make the cake of the world economy bigger and drive countries, which deem peace and development as their priorities, to achieve their own development goals. BRI stands for enhancing international cooperation including synergy of various development strategies, by building closer collaboration partnerships, which include advancing North-South, South-South, and triangular cooperation. Under the initiative, countries along the “Belt and Road” will strengthen physical, institutional and people-to-people connectivity by promotion of industrial cooperation, scientific and technological innovation, and regional economic cooperation and integration so as to participate in the global value chain. BRI endeavours to expand people-to-people exchanges, promote peace, justice, social cohesion, inclusiveness, democracy, good governance, the rule of law, human rights, gender equality and women empowerment; work together to fight against corruption and bribery in all their forms; to be more responsive to all the needs of those in vulnerable situations such as children, persons with disabilities and the old; and help improve global economic governance, and ensure equal access by all to development opportunities and benefits. BRI encourages countries to manage the natural resources in an equitable and sustainable manner, conserve and sustainably use oceans and seas, freshwater resources, as well as forests, mountains and dry lands, protecting biodiversity, ecosystems and wildlife, combating desertification, land degradation and climate change so as to achieve sustainable development in its three dimensions in a balanced and integrated manner. BRI which is rooted in the history, opens up to the future and aims at making all the participating countries gain from building it. “BRI is the most important international public goods provided by China so far. The Initiative is China’s idea, but the opportunities it creates belong to the world,” said Chinese Foreign Minister Wang Yi. There is huge economic complementarity and great cooperation potential between China and Sri Lanka. Currently, Sri Lanka is striving to build itself as a financing and logistic centre in the Indian Ocean. 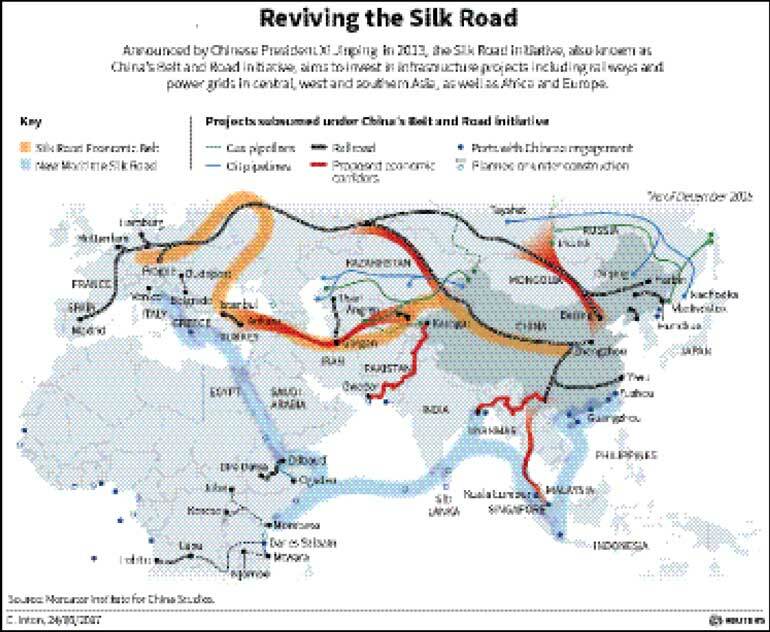 Such development goal is in line with the ‘21st Century Maritime Silk Road’ in many aspects. China and Sri Lanka are able to synergise development strategies and jointly build the ‘21st Century Maritime Silk Road’ through dialogue and consultation. During the pursuing of the common goal, China and Sri Lanka could improve the infrastructure facilities in Sri Lanka contributing to an international infrastructure network. Sri Lanka’s geographic location gives a promising future of shipping industry. Seizing the opportunity of development will improve Sri Lanka’s competitiveness in the international shipping market. Building free trade zone and accelerating the consultation of the free trade agreement will benefit the people of both countries. The Sri Lankan Government has showed its enthusiasm to actively participate in global value chains development and supply chain. It is foreseeable that Sri Lanka’s basic industrial system will be greatly improved if the Hambantota logistic and industrial zone could be operated as early as possible. Sri Lanka is planning to build an international financial city in Colombo. Our two countries can enhance financial infrastructure connectivity, jointly work on a long-term, stable and sustainable financing system. Bank of China has set up its South Asian Branch in Colombo. Moreover, Sri Lanka is able to make use of the Silk Road Fund, The China Development Bank, Exim Bank of China and Asia Infrastructure Investment Bank to enhance its financial capability. China and Sri Lanka could deepen cooperation in environment protection, natural disaster management and counter climate change. No matter floods or drought, the Chinese Government and people will always stand together with the Sri Lankan people and offer timely assistance. Meanwhile, China is ready to assist Sri Lanka in construction a comprehensive nationwide disaster warning, management and response (WMR) system. China and Sri Lanka both have long histories and bright civilisations. Both sides can strengthen dialogues between civilisation and cultural exchanges so as to promote tourism development and protect world cultural and natural heritages. Both countries can further encourage people-to-people exchanges and bonds by deepening practical cooperation on education, science, technology, sport, health, think-tank and media. Based on that, China granted more than 1200 scholarships, training and internship to Sri Lanka every year since 2015. China is one of the largest infrastructure construction partners and main source of foreign investments of Sri Lanka. China-Sri Lanka economic and trade cooperation has created more than one hundred thousand job opportunities for the local people, trained tens of thousands of technicians and managers, and promoted the rapid development of various sectors. Up to 2016, Chinese Companies in Sri Lanka has completed construction of infrastructure projects amounting to over $ 15.5 billion and made direct investment over $ 2 billion contributing a lot to Sri Lanka’s economic growth and social development. During the BRF Forum, President Xi Jinping announced that, China will offer CNY400 million (Rs. 8.8 billion) as aid given gratis to Sri Lanka this year, and CNY 2 billion (Rs. 44 billion) for the period 2018-2020. China and Sri Lanka signed four important cooperation agreement including China-Sri Lanka economic and technical cooperation agreement, the Outline of the Medium and Long-Term Development Plan for Investment, Economic and Technological Cooperation, the Framework Agreement for the Promoting of Investment and Economic Cooperation, financing cooperation agreements. These agreements cover future key cooperation projects and areas. President Sirisena and Prime Minister Wickremesinghe both expressed their willingness to actively participate into BRI and build Sri Lanka as the hub of Indian Ocean. Times keeps moving forward, we are looking forward to work together with Sri Lanka and jointly create a brighter future. BRI is a long-term cooperation program and needs efforts of generations. We are ready to cooperate with and assist Sri Lanka to carry out social and economic development. China always do what we say and promise. Time has proved and will witness China a friend indeed of Sri Lanka.